Co-founder and executive editor of YES! Magazine, Sarah Ruth van Gelder heads the development of each issue of YES!, writes introductory columns and articles, and heads the magazine's online presence. Van Gelder also edited the book, Saying Yes! 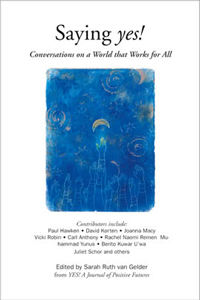 Conversations on a World that Works for All, (2000) a collection of interviews she had conducted for the magazine. More information on this book can be found at http://www.yesmagazine.org/products/saying-yes. Additionally, van Gelder is the co-editor of Making Peace - Healing a Violent World (2004).